Climate change is causing the seas to rise and storms to become stronger, more frequent, and more destructive. 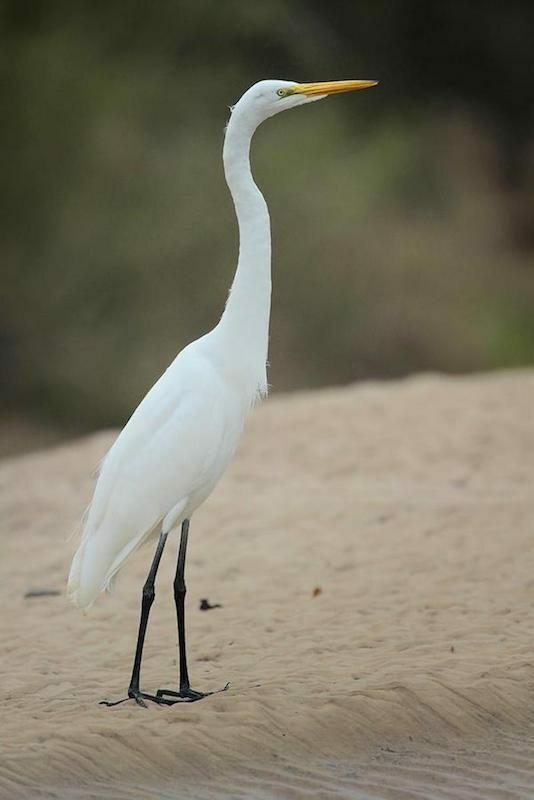 In order to protect the industry and people of the Texas coast, the State of Texas General Land Office, together with the Galveston District of the US Army Corps of Engineers, is preparing a Texas Coastal Protection Plan. The $20 million planning process began in 2015 and is expected to be completed by 2021. Upon completion a plan will be presented to Congress for authorization and funding, expected to be in the billions of dollars. 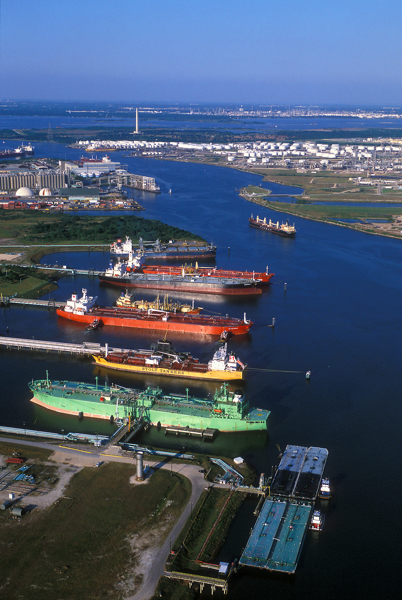 A significant part of the plan, which incorporates both large-scale engineered infrastructure and ecosystem restoration, focuses on the potential for a big storm to send a surge of seawater through Galveston Bay and up Buffalo Bayou into the Port of Houston, inundating the chemical plants and refineries and neighborhoods there along with downtown Houston, as well as houses, businesses, and highways on the coast. In October the Corps released a draft feasibility study for the plan along with an environmental impact statement for the draft study. Since then they have been holding public meetings about it up and down the coast. The next meeting is Saturday, Dec. 15, in Crystal Beach at Crenshaw Elementary and Middle School, 416 State Highway 87, from 1 to 4 p.m. The next and final meeting is Tuesday, Dec. 18, in Seabrook, at the Bay Area Community Center, 5002 E. Nasa Parkway. The meeting begins at 5:30 p.m.
You can read the documents and find out more about the process and the public meetings here. 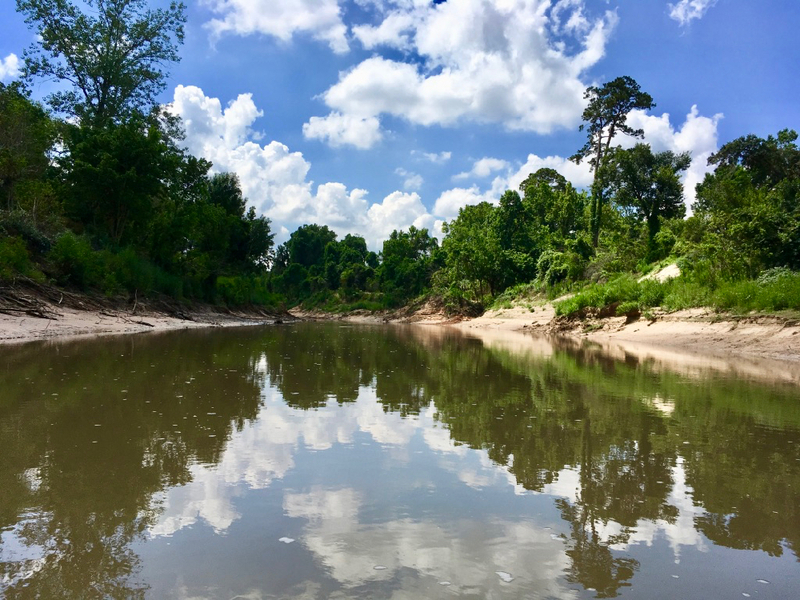 On Tuesday, Dec. 11, 2018, a group of regional and national environmental and conservation organizations, including Save Buffalo Bayou, released their response to the draft study and associated environmental impact statement. The advocacy group response noted that there was no clear indication of where the various structures will be placed and few details on the overall impacts. They called for greater private sector responsibility for protecting private industry and keeping people out of harm’s way and for regulations preventing development in floodways and floodplains. Structural approaches, such as building dams, dikes, and levees, work against nature, encourage development in flood-prone areas, and should only be used where non-structural or nature-based methods are not feasible, they said. 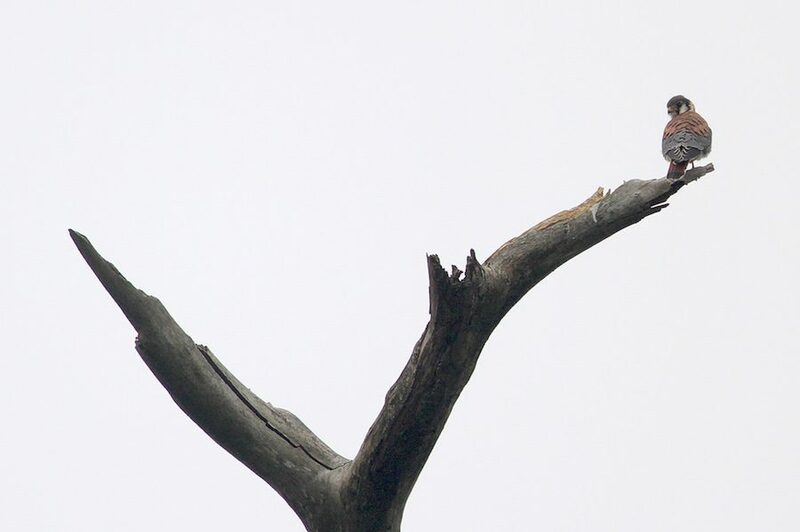 You can read the full statement from the conservation groups here. 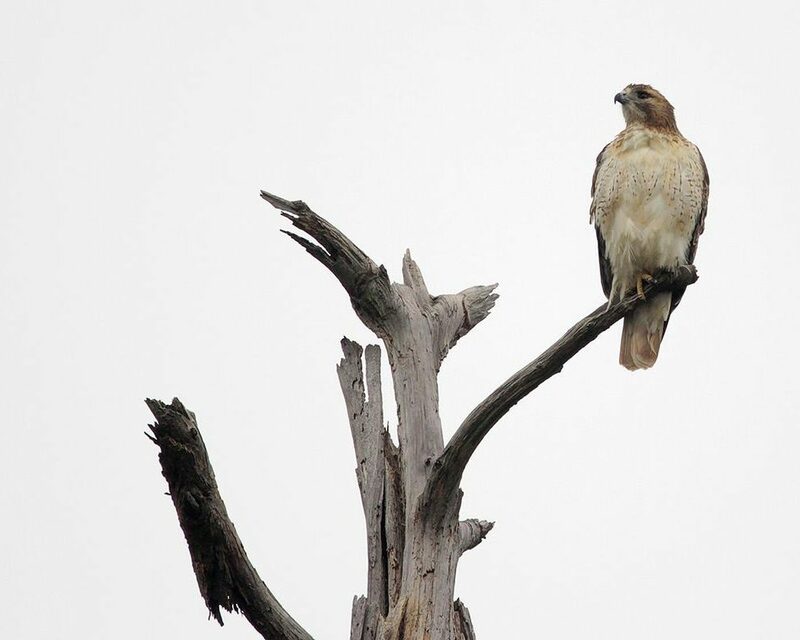 Read the comment from the Houston Sierra Club here. More information is available about the coastal protection plan and process through this notice in the Federal Register. 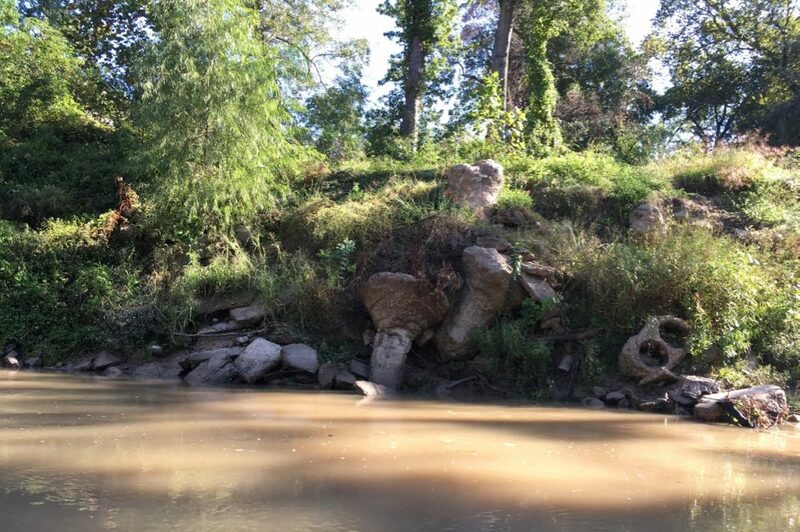 So recently the Chronicle blew the secret that there are giant alligator snapping turtles in Buffalo Bayou. But apparently it wasn’t much of a secret. Turns out that lots of people already knew about alligator snappers in the bayou and elsewhere. 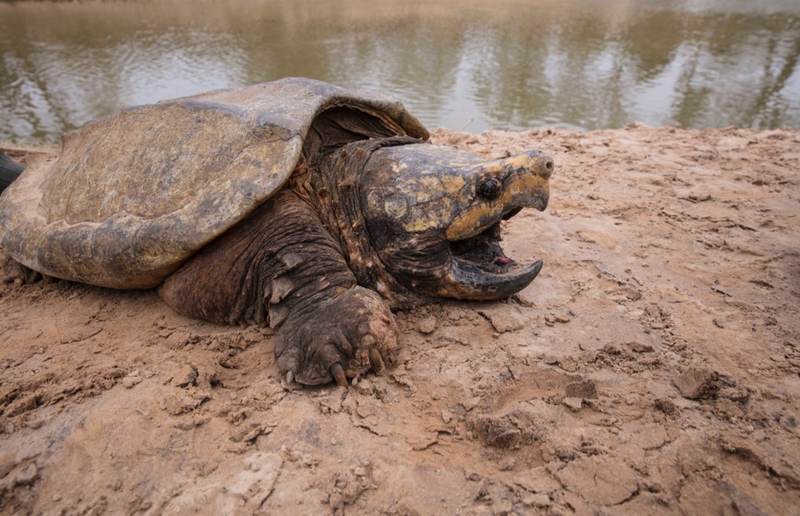 We posted the article on our Facebook page, and we were bombarded with stories and photos of close encounters with the big snappers over the years—as near as back yard ravines. 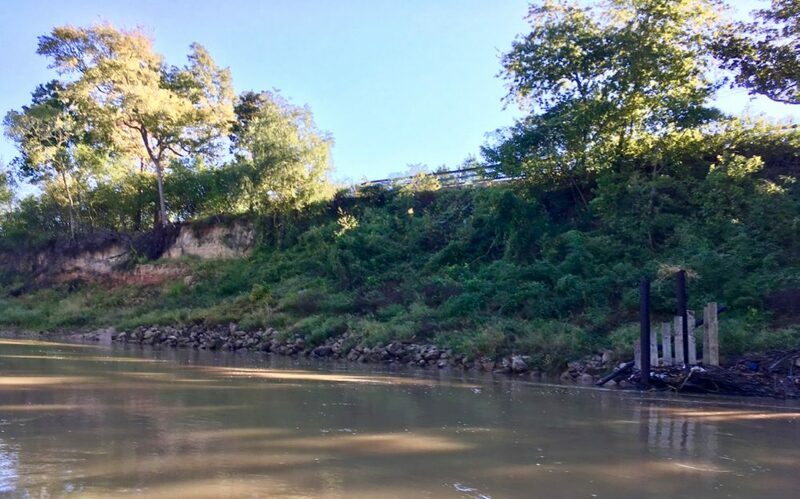 Last year volunteers with Save Buffalo Bayou participated in this long-term project sponsored by the Turtle Survival Alliance to tag and track the massive turtles, the operation described by the Chronicle’s Molly Glentzer. The turtles, the largest freshwater turtles in the world, are designated a threatened species by the State of Texas, which means it is against the law to capture, trap, take, or kill them, or even think about doing that. They happen to be an ingredient in classic New Orleans-style turtle soup and therefore subject to poaching, which continues in the state, even though these days alligator snappers for cooking are farm-raised. We were asked to keep quiet about the turtles until the turtle scientists had a better idea of how they were doing here. Apparently they are doing pretty well. 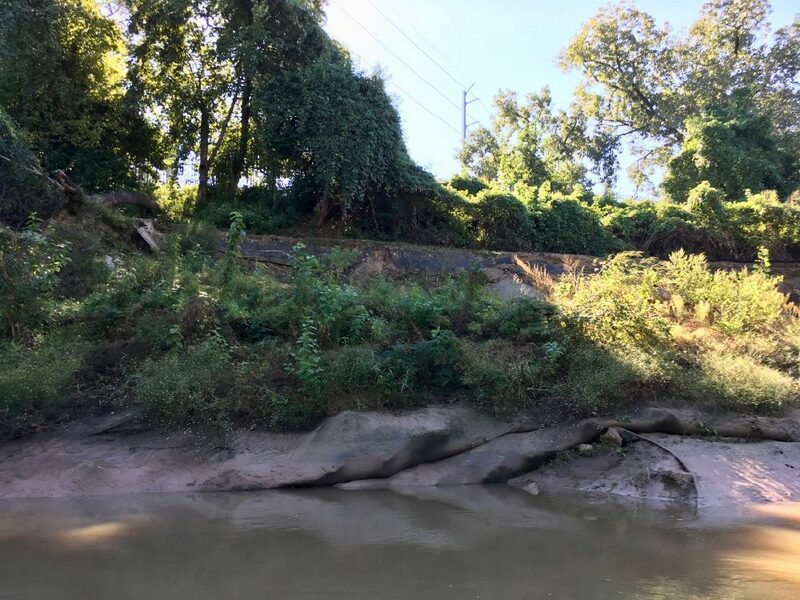 Harris County Commissioners’ Court has approved a $350,000 contract to study a controversial proposal for installing large concrete culverts through meanders on Buffalo Bayou. The contract was awarded at a commissioners’ court meeting Nov. 13 to Texas-based engineering firm Huitt-Zollars. It also calls for studying the “hydraulic performance of bridge crossings” on the bayou as well as the “high-flow bypasses” of meanders. The meander bypass plan is based on a misunderstanding of the causes of flooding upstream and the beneficial function of meanders in streams. The idea was proposed by neighborhood activists living above Beltway 8 who blame the meanders of the bayou below the beltway for exacerbating flooding of their homes in low-lying floodplains adjacent to a six-mile-long stretch of the bayou that was straightened in the Fifties. That stretch of the bayou is now Terry Hershey Park, owned by the Harris County Flood Control District. 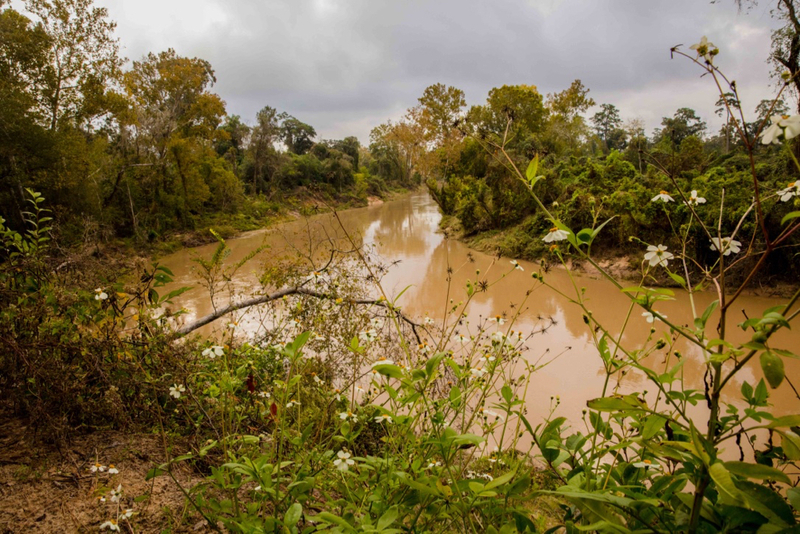 A study commissioned by Save Buffalo Bayou found that the bypass plan is likely unfeasible and could increase flooding and erosion of property downstream. Save Buffalo Bayou is opposed to meander bypasses, which would be highly damaging, counterproductive, and a waste of public funds. It was just after sunrise on a beautiful fall day. 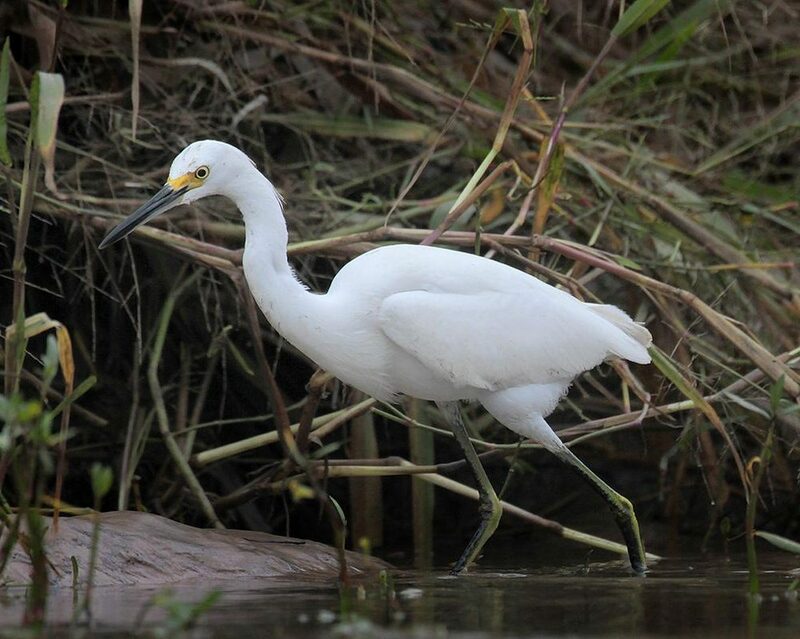 Save Buffalo Bayou advisory board member Janice Van Dyke Walden had suggested a paddle down the bayou. We slid her wooden canoe into the water at the Woodway boat launch in Memorial Park and cast ourselves into the current. The water was high and the flow fairly fast, about 700 cubic feet per second, strong enough to keep us moving without doing much except dip our paddles in occasionally. Janice did most of that. The opaque brown water was roiling, disturbed by mysterious conflicts below. The fin and scaly back of a huge creature suddenly broke the surface—an alligator gar, one of the largest freshwater fishes in North America, and maybe one of the oldest, having been around for over a hundred million years. We were pleased to see that some large trees had been left parallel to the bank with their roots towards the current. This is the science-based practice that floodplain managers recommend. 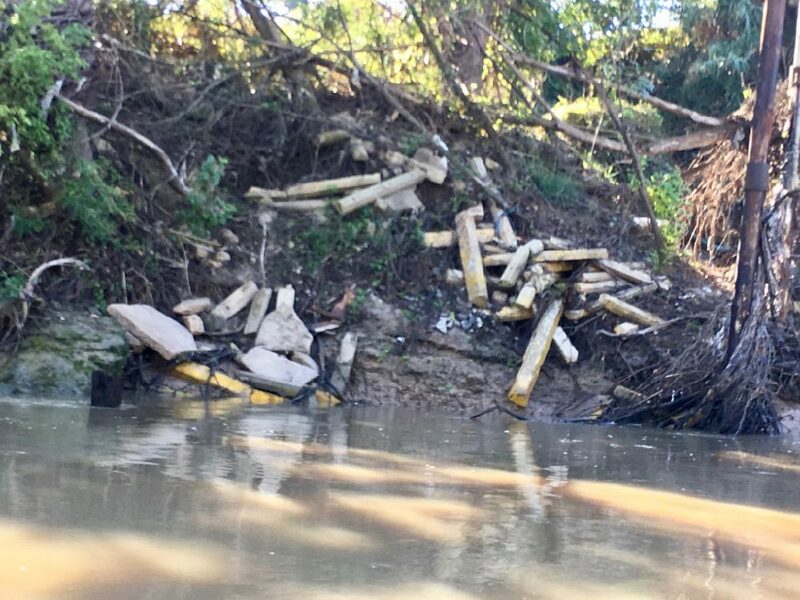 We were critical of contractors hired by the Harris County Flood Control District to remove debris in the channel after Harvey. Paid by the pound, they were cutting down live trees and pulling up all the large wood. 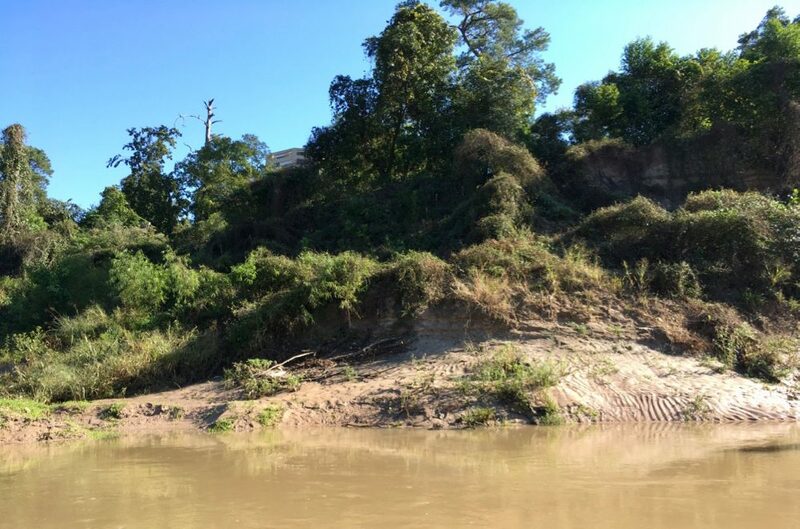 Large woody debris on the banks is essential for collecting and controlling sediment, protecting against erosion, and rebuilding the banks after floods. Harvey made big changes in the bayou. Among other things, a small stream that drains the eastern edge of Memorial Park had shifted and cut through the sandy bank of what we call the middle meander. Further downstream another small tributary flowing through the Hogg Bird Sanctuary had likewise shifted slightly upstream and now cuts through a narrow spit of land that was clearly going to go some day. The former mouth of the stream below a high bluff in the public park had been blocked with sediment. 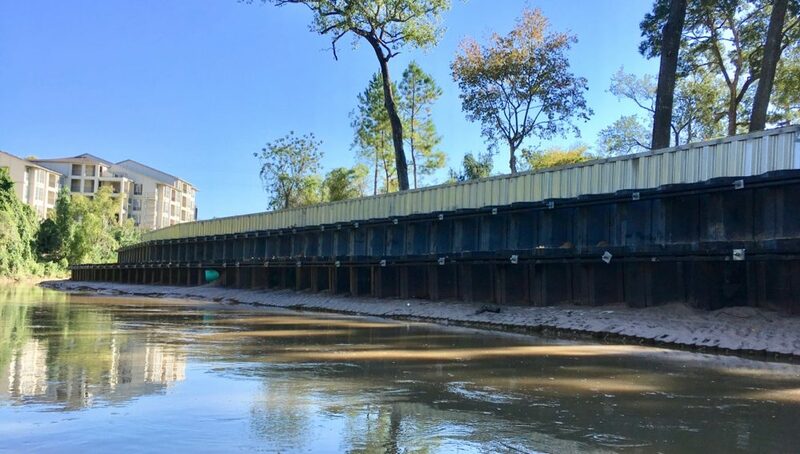 Watch this nine-minute video of our early morning float down Buffalo Bayou. Or watch this slideshow of photographs from the trip. 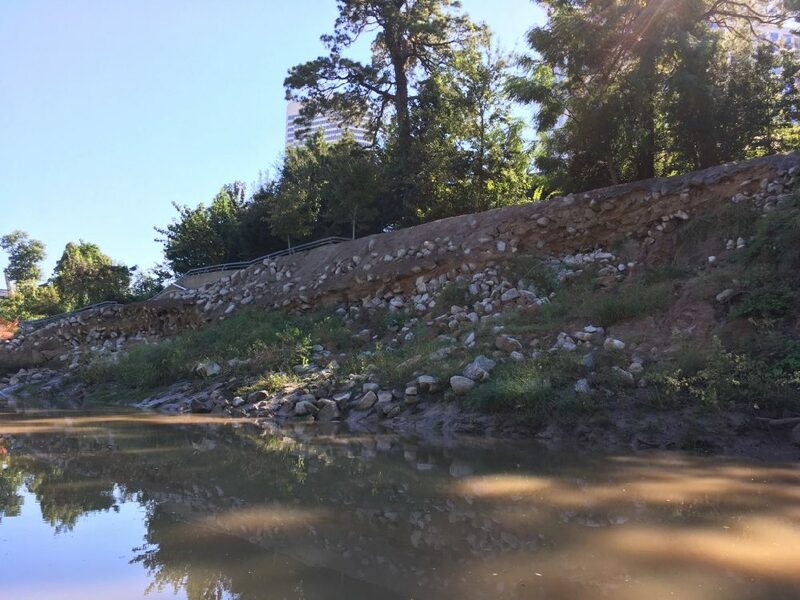 Riprap and grass above a sheet pile wall recently installed by private developers on the south bank of Buffalo Bayou in Uptown. Looking downstream on Buffalo Bayou. 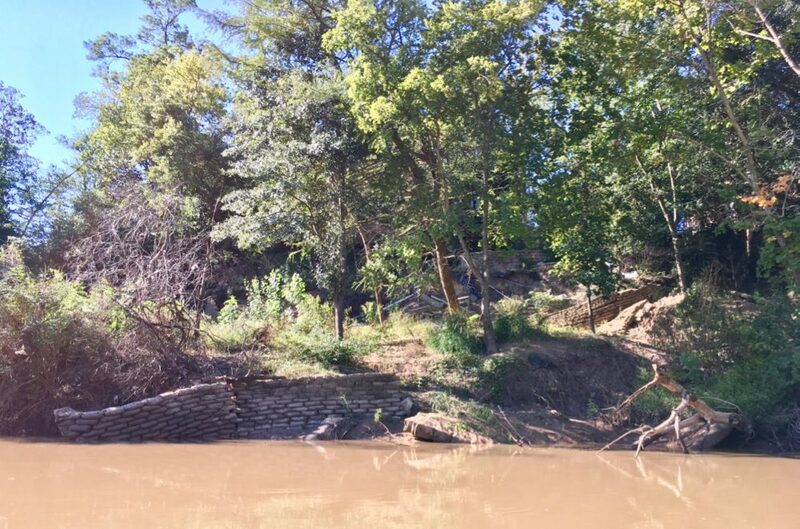 Trees shade the flowing water and help protect the bank from erosion. 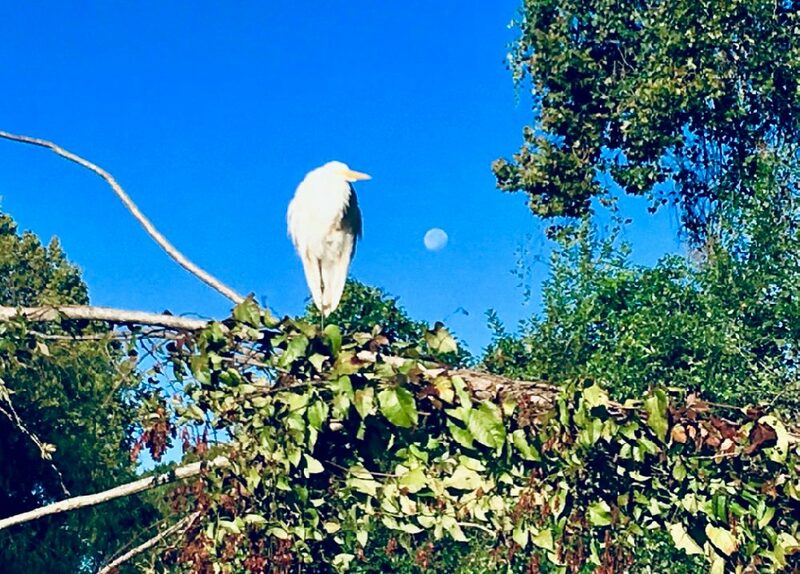 A great egret rests in a tree on the north bank as the moon sets and the sun rises. Memorial Park on the left. 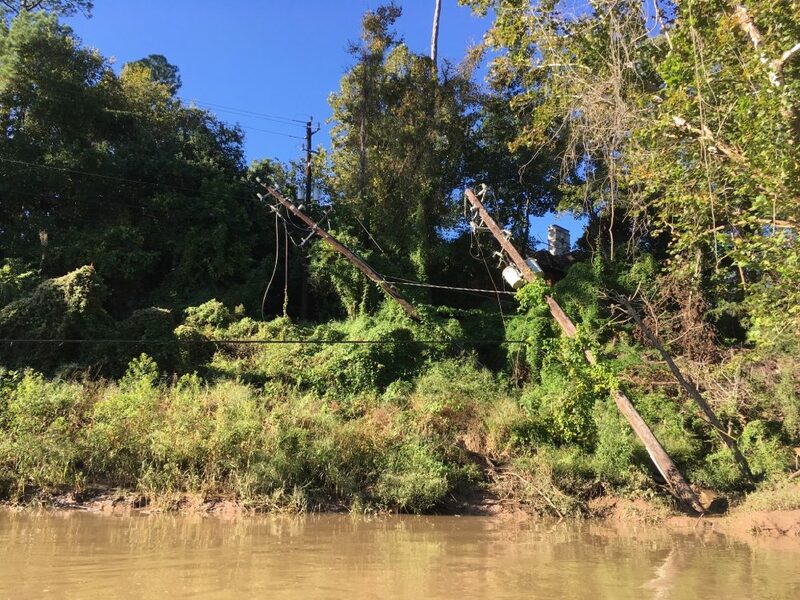 Fallen utility lines on the right (south) bank. 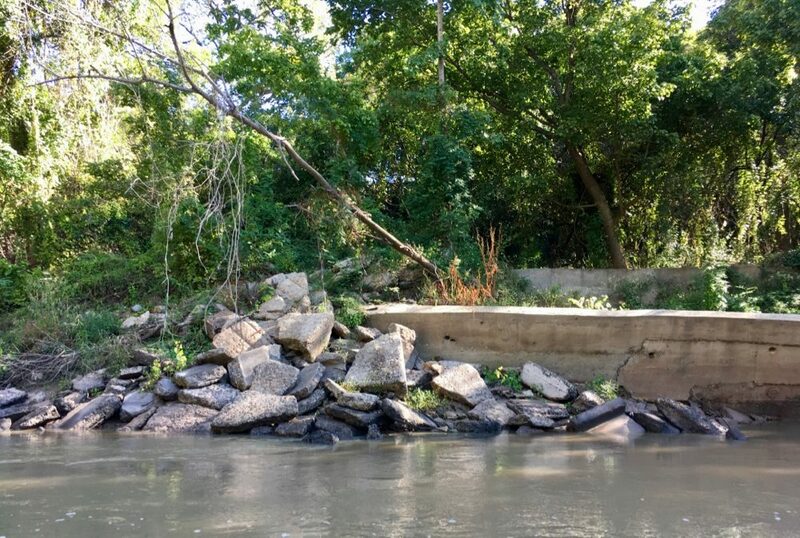 Riprap placed by the River Oaks Country Club on a slumped bank in 2015. Riprap can cause more erosion upstream and downstream, and in this case has damaged public parkland across the way. Bank had been stripped of trees and planted with short, mowed grass, and a concrete path for golf carts installed. 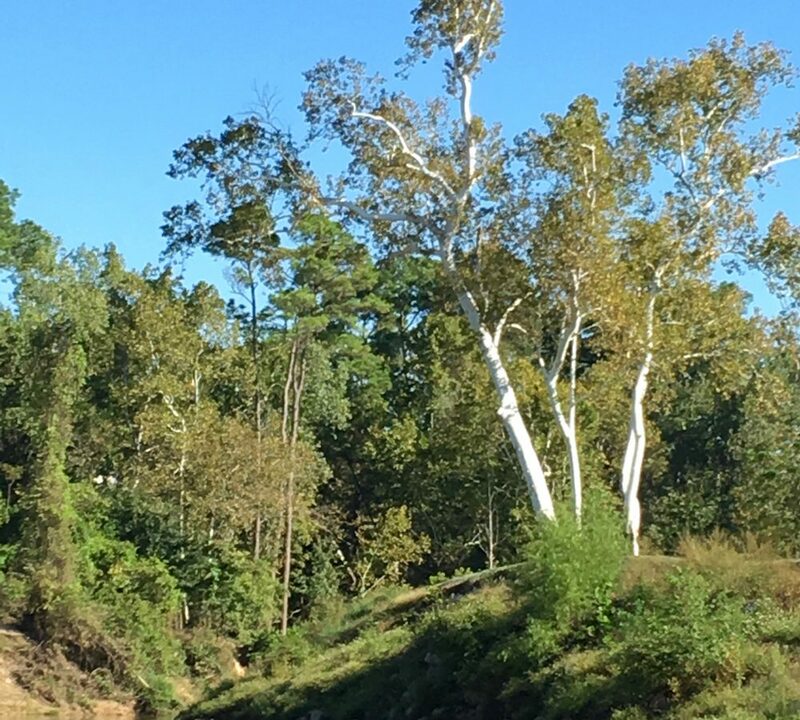 A beautiful sycamore stands tall on a bend in the bayou. High banks of Memorial Park on the left. Collapsing bank on country club property that had been stripped of protective trees and planted with short, mowed grass. Concrete parking lot debris dumped on south bank below country club property. The high bluffs and sandy bank at the eastern edge of Memorial Park. Floating out of the stream that now cuts through what was the wide sandy bank of what we call the middle meander. The stream empties into Buffalo Bayou in the distance. Leaving Memorial Park, continuing downstream with private residences on the left, country club on the right. Another beautiful sycamore, this one on a point that is part of the city-owned Hogg Bird Sanctuary. 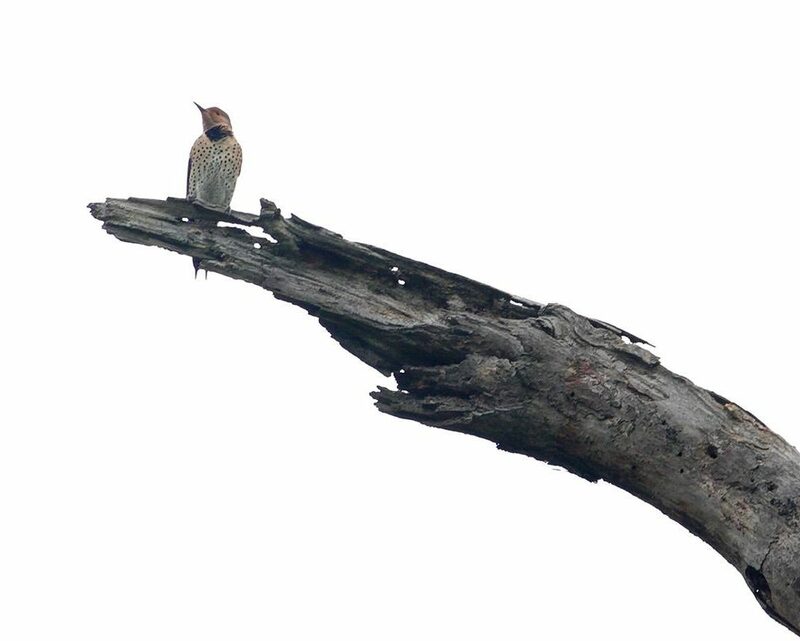 The high bank of the Hogg Bird Sanctuary. The small creek that emptied here has changed course, moving further upstream. Concrete construction debris dumped below private property on the north bank. Massive private erosion control project recently installed on south bank with sheet piling driven deep into the channel. Dumped debris and failed concrete erosion wall on south bank. More failed attempts at erosion control on the south bank. Continuously collapsing sidewalk in Buffalo Bayou Park has been repaired numerous times. 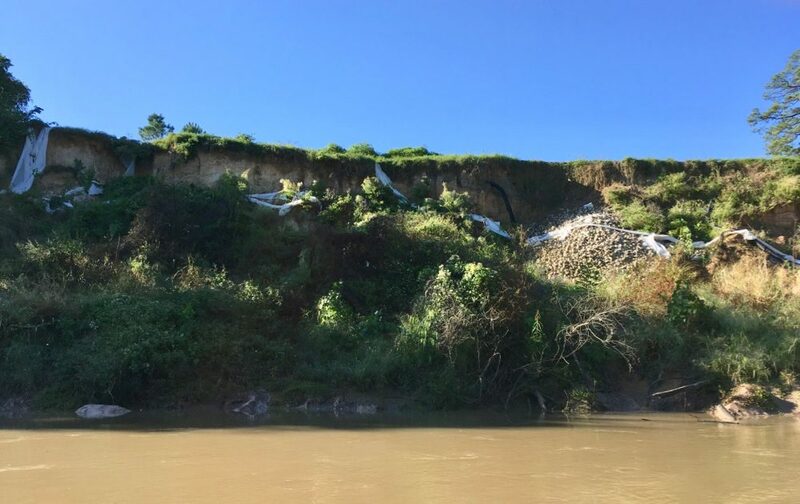 Collapsed bank and boat takeout below the Dunlavy in Buffalo Bayou Park. 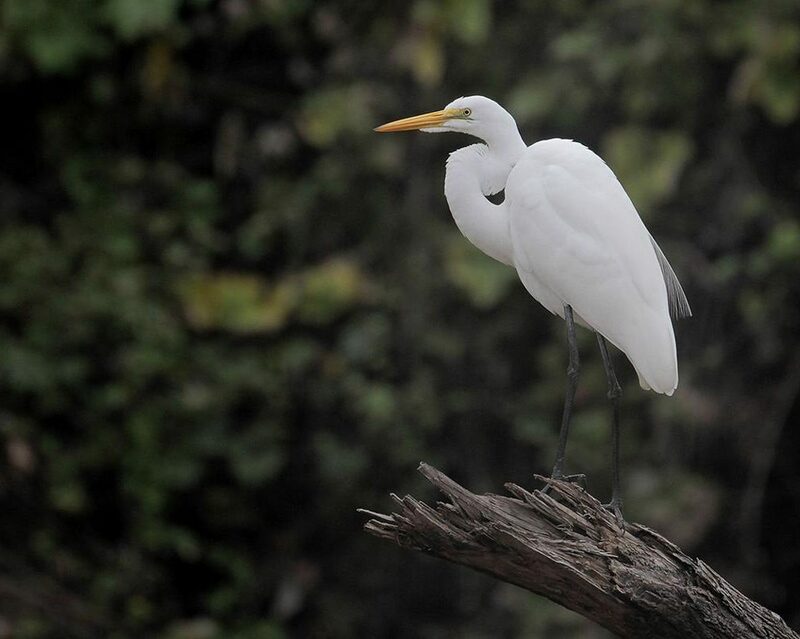 KHOU television (Channel 11) is airing a four-part series on the hidden wilderness of Buffalo Bayou in Houston. Thank you, KHOU. 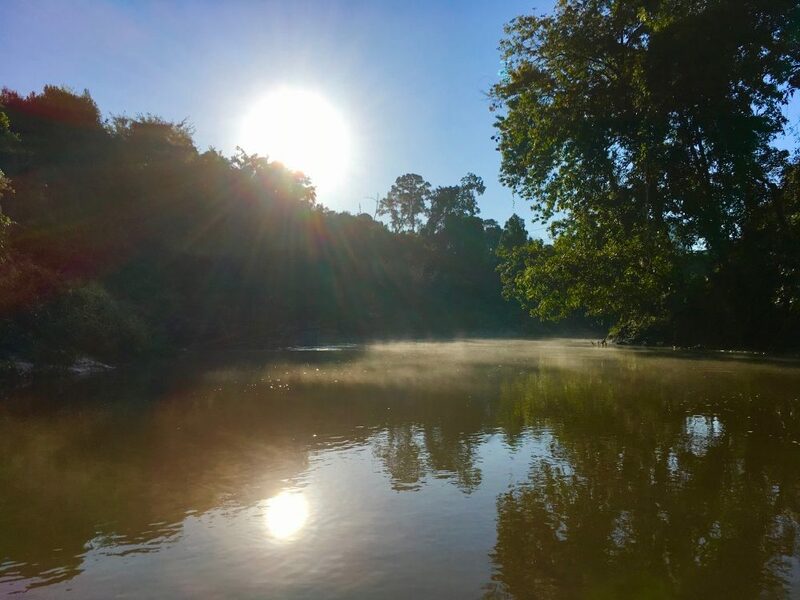 Titled “Brandi on the Bayou: Buffalo Bayou’s Hidden Wilderness,” the series is reported by KHOU’s Brandi Smith and airs Tuesday mornings at 6 a.m. 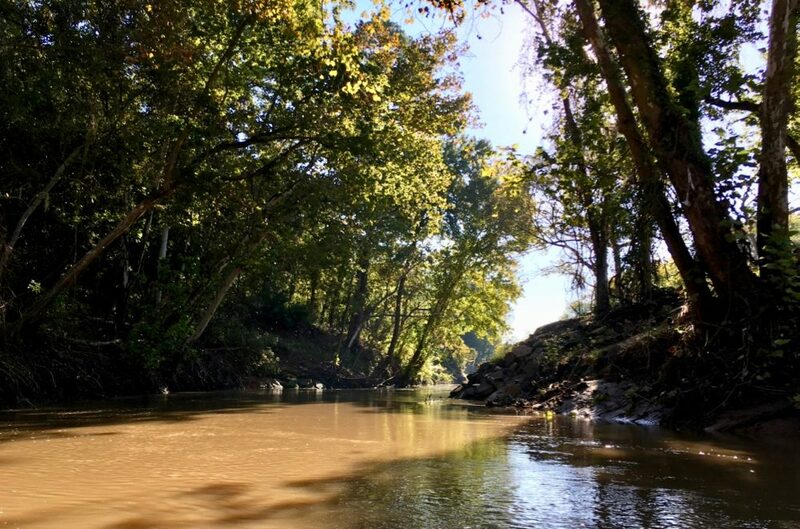 The first episode was broadcast Tuesday, Nov. 13, and featured geologist, river guide, naturalist, and Save Buffalo Bayou board member Tom Helm. You can watch that first episode here and the second episode here. The next episode airs Tuesday, Nov. 27, at 6 a.m. and the final episode on Dec. 4. All the episodes will be available online. 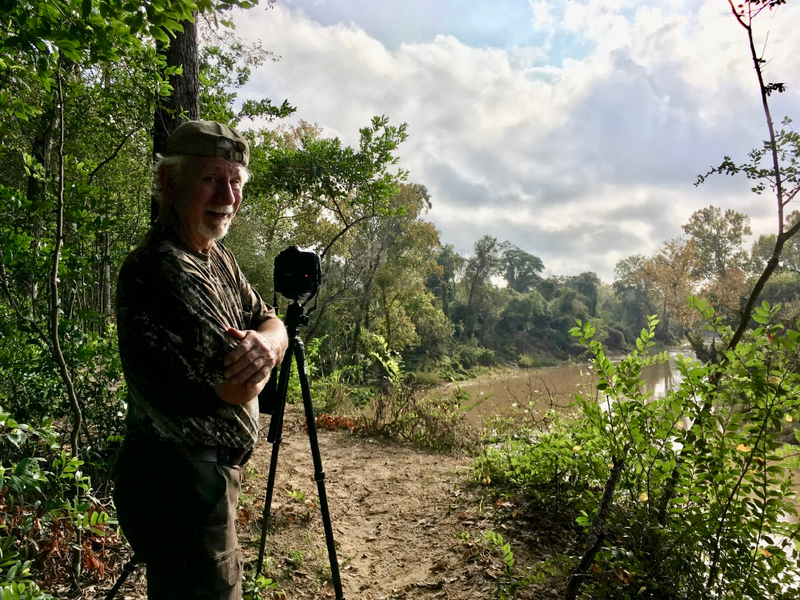 Tom Helm talking beavers and geology in “Brandi on the Bayou: Buffalo Bayou’s Hidden Wilderness,” airing Tuesdays at 6 a.m. on KHOU Channel 11 through Dec. 4. But you don’t have to be a television reporter to float down Buffalo Bayou learning from Tom Helm. 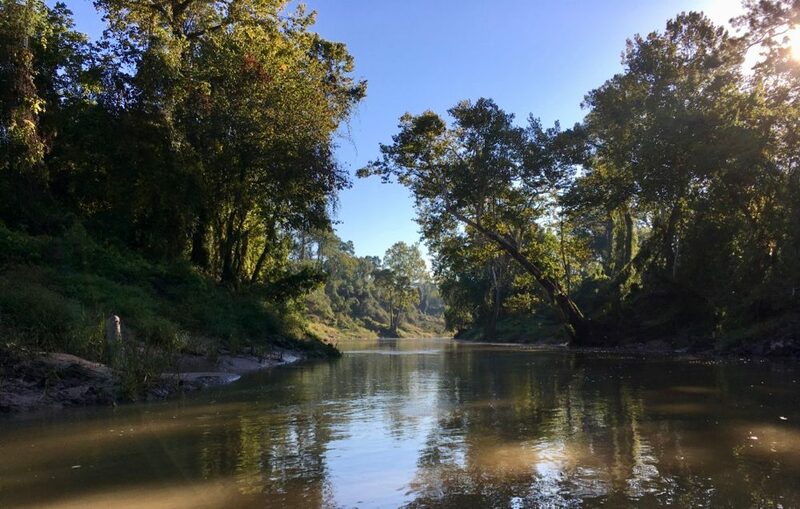 Helm offers geology classes on the bayou. 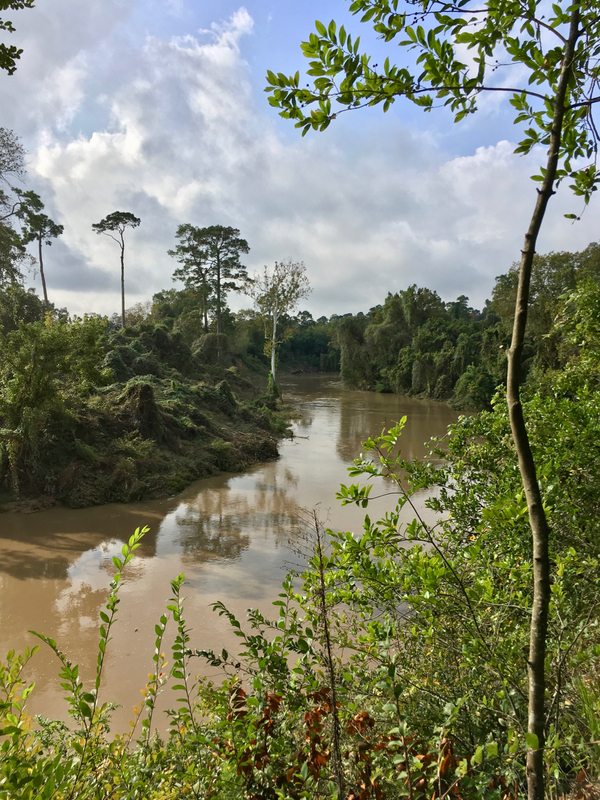 Find out more about the ancient history of this 18,000-year-old bayou, where it comes from, where it’s going, and why understanding the natural function of a dynamic river is important for effective flood risk reduction. Houston has rocks, and they are hundreds of thousands of years old! 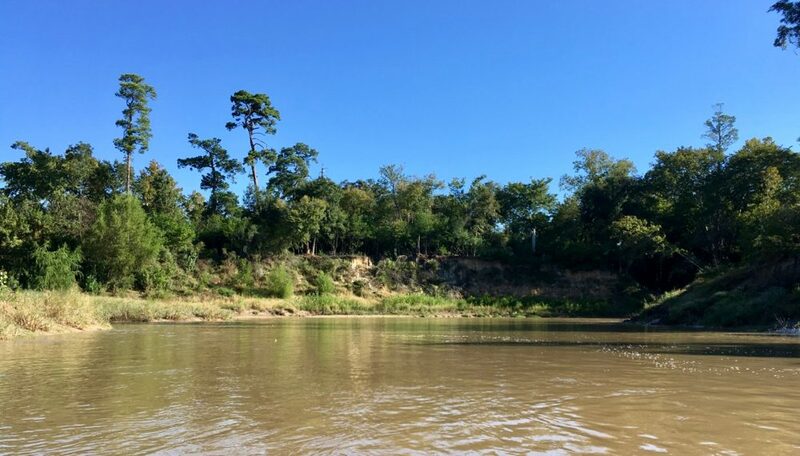 In addition Helm offers a Happy Hour Bat Trip with refreshments on Buffalo Bayou in Buffalo Bayou Park. We were a little delayed for a fall photo of that Bend in the River. 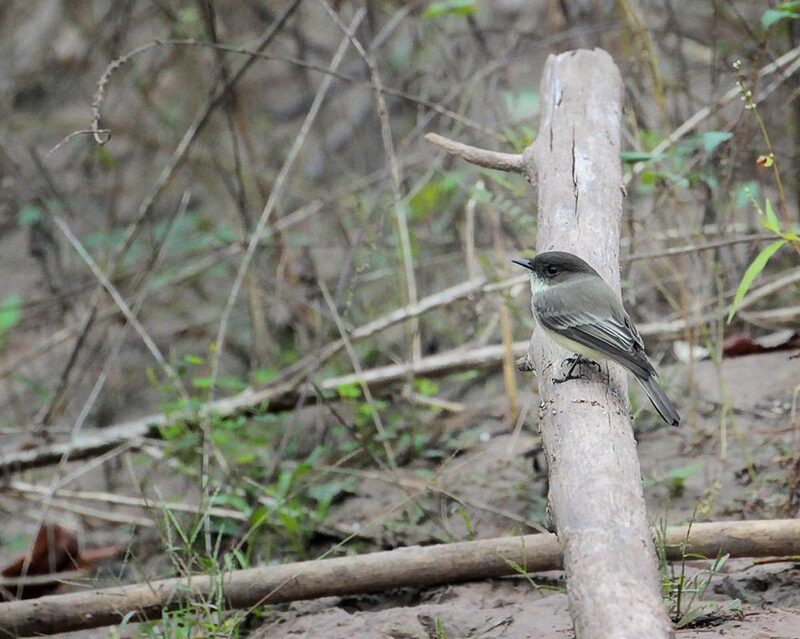 We have been documenting this particular place on Buffalo Bayou through the seasons for more than four years. Photographer Jim Olive has obligations elsewhere these days, so we had to go with the day he could be here and the early morning weather on that day. It was overcast and the flow was a high, a little under 2,000 cubic feet per second (cfs). It had been raining. 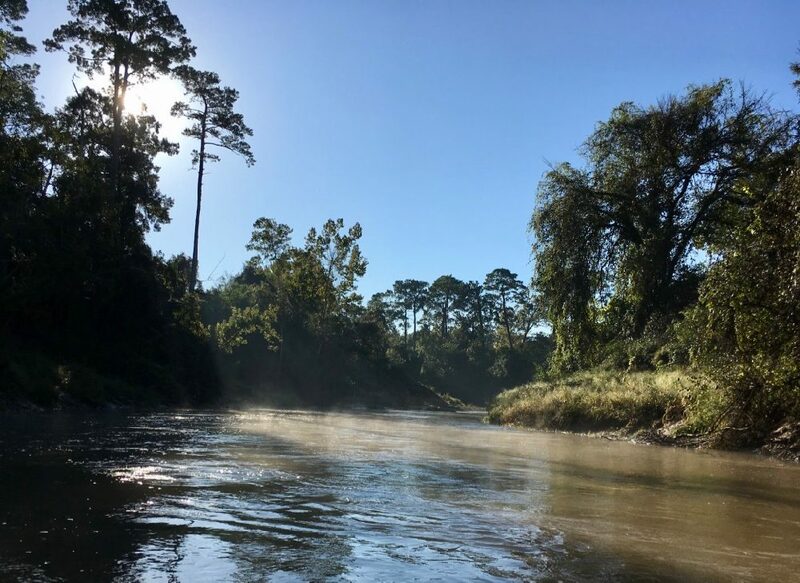 Base flow in the bayou–normal flow when it’s not raining–is about 150-200 cfs. But we waited and waited for the right moment, which is what a professional photographer does. We were standing on that same high bank in Memorial Park in the middle of Houston looking at the bayou flowing downstream with River Oaks Country Club property on the opposite bank. It was the same location, but as you can see if you look at Jim’s series of photos, it has changed through the years. Nature is not static. Jim patiently shifted position and cameras and lenses. In the meantime, as usual, the photographer’s assistant wandered off, looking around, mainly for something edible to forage, and found some small puffball mushrooms growing on a rotting log. These little, round white mushrooms are variously described as “edible” or “choice.” The latter means delicious. “Edible” means they won’t kill you but they don’t necessarily taste good. There were daisies growing on the high bank, and suddenly a big orange and black Monarch butterfly was fluttering there, feeding on the flowers on its way to Mexico. If you look closely, you can see where it had been in Jim’s photo. Fall 2018 on that Bend in the River. Water was high and the morning was cloudy just after sunrise. 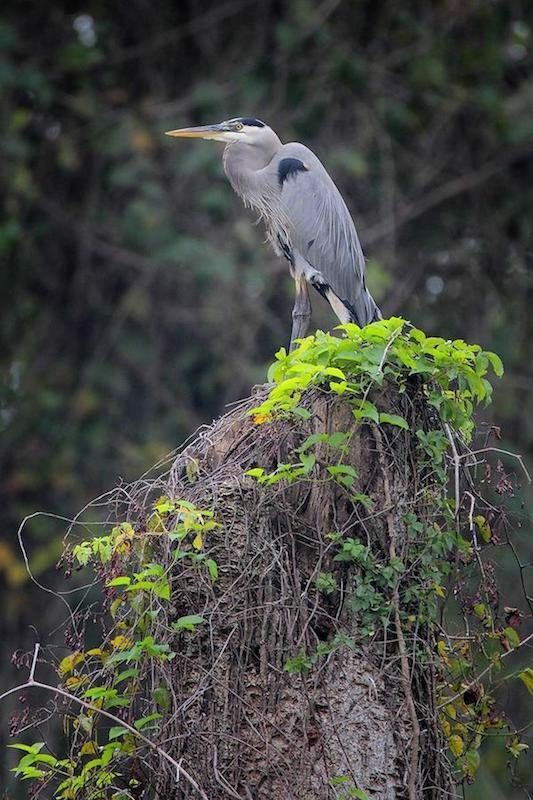 Photo by Jim Olive on Nov. 6, 2018. As we were leaving we encountered the most beautiful coral snake on the path through the woods, right where we had seen a gigantic, sleeping king snake coiled up in the old, broken drainage pipes left over from Camp Logan, the World War I training camp and military hospital that occupied this land back then. This snake was “red and yellow, kill a fellow” and not “red and black, all right, Jack,” so definitely a coral snake. Turns out there are numerous variations of this ditty we learned as children to distinguish a highly venomous coral snake from the harmless milk snake. But a coral snake is not aggressive. And it can hardly bite. So not really dangerous at all unless you try to pick it up. This one was very large and shiny. 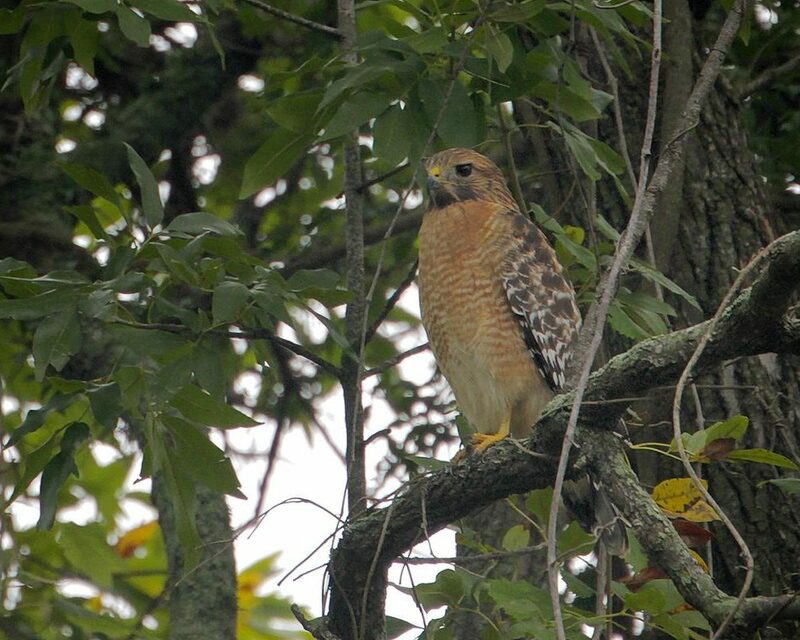 Jim, an expert naturalist, thought maybe it had just shed its skin. Here is a video of the coral snake. As for the little puffballs, they were okay. Ordinary, really. Not as delicious as the honey mushrooms or oyster mushrooms one can find growing in the park and along the bayou. 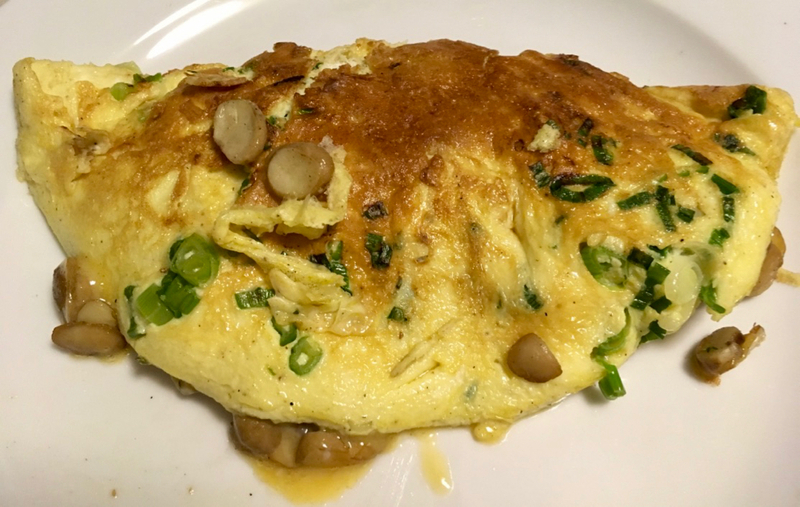 The photographer’s assistant made a mushroom omelette. 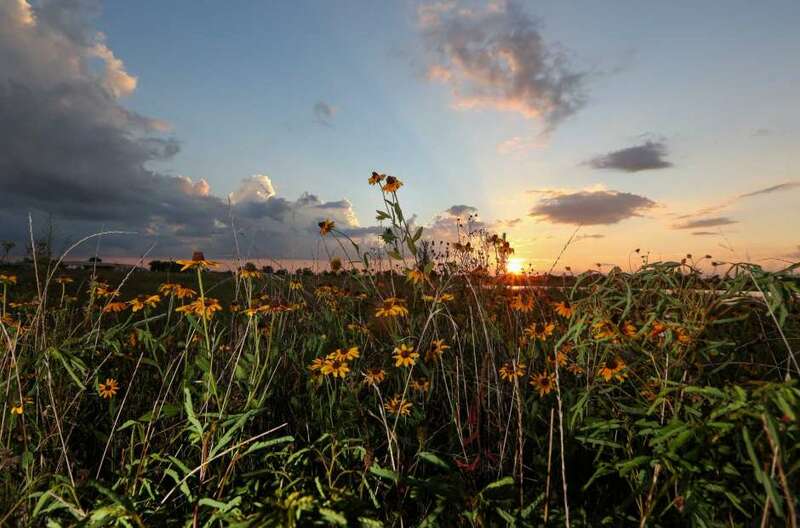 Q: How could preserving the Katy Prairie help minimize flooding? A: Preserving the Katy Prairie alone can be useful and, with management, even private lands that are in cattle production can be useful. Mainly, it is about getting roots to penetrate the soil and water following the roots down into the ground. If you combine that will a small levee like what is in rice fields, you can perhaps pond another foot of water on the flat land. Together, the potential to store water is substantial. Q: It’s been said that the Katy Prairie acts like a natural sponge. How does this work? A: The roots of prairie grasses penetrate and break the soil, and in doing so, they create natural pathways. There is space around the root, and the water naturally penetrates. Those roots go down five or six feet. With roots in the soil, a very impermeable clay soil can become permeable. But the more we listened, the odder is seemed. Above all because the project is dead. 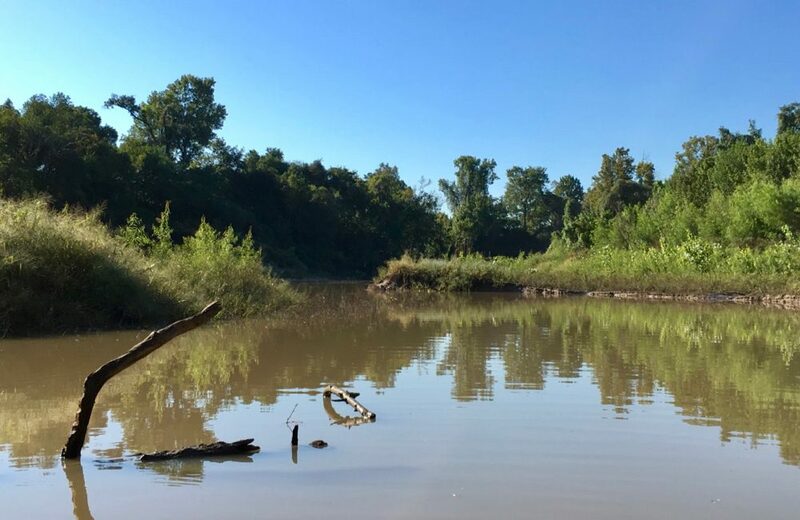 Save Buffalo Bayou was founded over four years ago to stop this pointless project, which was promoted by Kevin Shanley of SWA Group, the landscape architecture firm responsible for Buffalo Bayou Park. (See the problems here.) 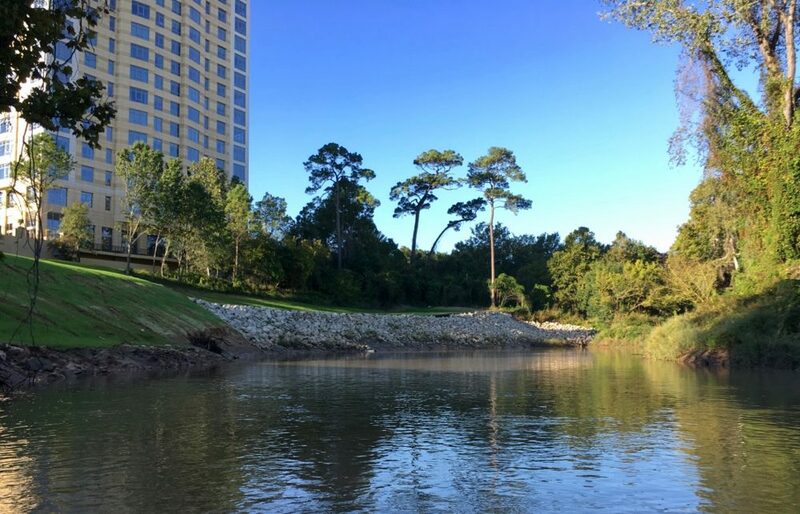 The firm also happened to be on retainer with the Harris County Flood Control District, which became the official sponsor of the project, believing it had community support. Shanley was then the president of the Bayou Preservation Association. And for a time the project manager for the engineering firm hired to do the project was also on the board of the association. In any case, it was a terrible, unpopular idea that served no good purpose and wasn’t going to work anyway. Based on a faulty analysis of bank collapse on the bayou, the project cost had increased from $6 million to $12 million. 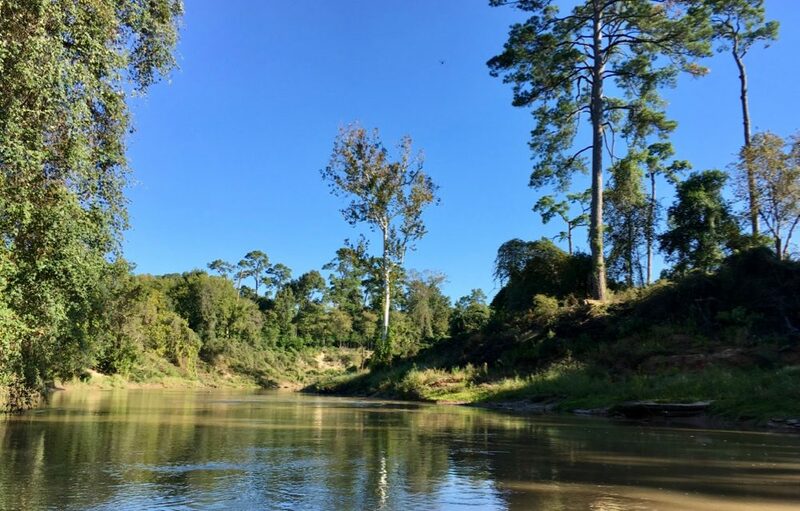 And after Harvey in August 2017, Flood Control District Director Russ Poppe, who inherited the project from his predecessor, publicly declared at a Bayou Preservation Association symposium that the project would not be going forward. It turned out that the radio interview with Merz was five years old, and someone at KPFT had pulled it off the shelf to fill air time. Station manager Don Freeman was apologetic, explaining the station operates “on a shoestring.” We urge everyone to support the nonprofit KPFT, a valuable public resource.